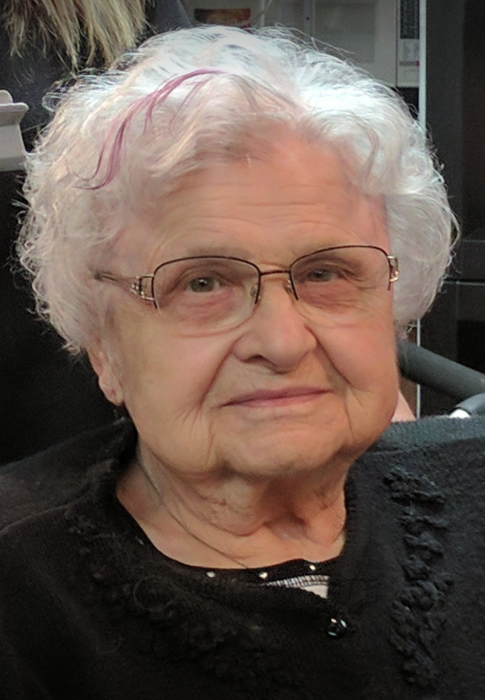 Luella passed away peacefully at the Regina General Hospital at the age of 94. She was predeceased by her husband Paul in 2011 and son Blake in 1980, her parents George and Dolly Lowenberger, sisters Norma, Esther, Joan and brother Ken. Luella is survived by her daughters Barb (Bob) Sentes of Raymore and May Molofy (Kevin Engelking) of Ardrossan AB, grandchildren Sarah, Abby (Derek) and Lindy Sentes, Cameron and Jenna Molofy, great-grandchildren Carson and Kira Karlunchuck and one sister Ruth Bodie of Claresholm AB. Luella spent her childhood in several small town communities east of Yorkton. As a young woman Luella moved to Regina and worked as switchboard operator at the Regina General Hospital. Through mutual friends she met a handsome young man that stole her heart. She married Paul Ruckle on October 23, 1955 and raised their family on the Ruckle homestead south of Raymore. She was a homemaker, a 4-H leader, a member of the Order of the Royal Purple and sat on the board of Silver Heights Auxiliary. In 1990 they moved into Raymore where they enjoyed their retirement. In 2014 Luella moved to the Eastview Lodge where she enjoyed card games, bingo and other activities. In January 2018 she moved to Silver Heights Special Care Home. The family would like to thank the staff of Silver Heights Care Home for making her feel at home. Donations in Luella’s memory may be made to the Touchwood Hills Mobility Bus Fund c/o Silver Heights Special Care Home. A Memorial Service will be held at 1:00 p.m. on Saturday, September 15, 2018 at The Trinity Lutheran Church, Quinton, SK. She will be laid to rest with her husband and son at Raymore Sacred Heart Parish Cemetery. Arrangements in care of John Schachtel - Mourning Glory Funeral Services (306) 978-5200.